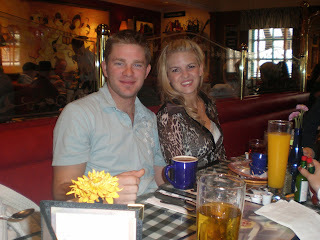 Last week we went out Sunday Brunch with Brendan, Jack, Scott, Joanne & Rachael & the three of us. It was fun for about 10 minues. We were all talking and visiting. Steve and I actually got a picture with just the two of us for the first time in a long time. So I had to post it. When I printed this picture to scrapbook it, i came across a picture from when we were young and had to put it up to. It was so cool to be able to compare pics from the span of a decade. From young teens with a crush to happily married parents. I thought it was neat. 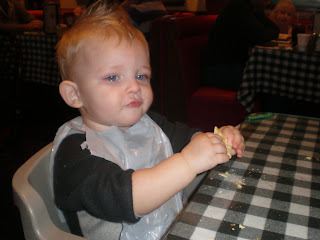 Anyways, Griffin decided to bring his attitude with him to brunch...as you can see from the picture. He threw the biggest fit. It was so embarassing, so I got my food to go and took him home...he fell asleep on the way home and I put him down for a nap and actually finished my book before everyone came back to our place!!! So all is well that ends well.